Claude Thornhill (August 10, 1909 – July 1, 1965) was an American pianist, arranger, composer, and bandleader. He composed the jazz and pop standards “Snowfall” and “I Wish I Had You”, the latter recorded by Billie Holiday. Thornhill entered the Cincinnati Conservatory of Music at age 16. That same year he and clarinetist Artie Shaw started their careers at the Golden Pheasant in Cleveland, Ohio with the Austin Wiley Orchestra. Thornhill and Shaw went to New York together in 1931. 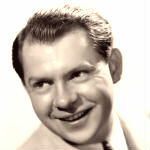 Claude went to the West Coast in the late 1930s with the Bob Hope Radio Show, and arranged for Judy Garland in Babes in Arms. In 1935, he played on sessions for Glenn Miller’s first recordings under his own name, as Glenn Miller and His Orchestra. He played on Glenn Miller’s composition “Solo Hop”, which was released on Columbia Records.